Boost the versatility and power of your boat. Limit the noise and achieve precision boat control. 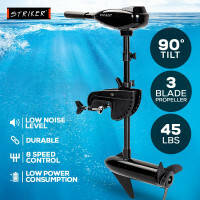 Striker has entered the growing outdoors market of Australia and has proudly launched a classy line of Trolling Motors to make your fishing experience more memorable, enjoyable and exciting than before. 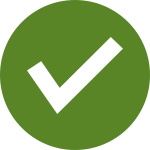 With 90-, 60- and 45- pound thrust selections to choose from, you can easily assess and pick the one that is compatible with your boat. Durability will not be a problem as the trolling motors feature corrosion-proof composite materials, a weedless three-blade propeller, a super strong shaft as well as an all alloy head to ensure that it can be used for a long time. Steer your boat and reach the waters which you haven't visited in the past. Among the key features of Striker Trolling Motors are the three-step twist-tiller reverse and five-step twist-tiller forward speed controls that will surely help those onboard to easily get into their favourite areas as quietly as possible. Suitable for both freshwater and saltwater and works well with inflatable boats, canoes and other types of small water crafts, these trolling motors will give you superior performance since they are equipped with 24V battery and are known for their super low power consumption feature. To sweeten the deal, the products all have a clear LED display and a six-inch telescoping handle so users can easily steer the boat. Make the most of your fishing moments. In addition to the trolling motors, purchase the Underwater Cameras from Mytopia and capture every remarkable experience that you will have. In love with the nature? Mytopia is also a home to great products such as Snorkels, Trekking Poles, Hunting & Shooting, Gazebos, Paddle Boards, Camping Washing Machines, Portable Showers, Solar Panels, Portable Ovens and Generators that will help you have the most comfortable outdoor experience ever! Level up your fishing performance! Purchase any of the Striker Trolling Motors now and get a 12-month warranty on us!